Binding the Past to the Present Through Remembrance, a Heritage Lottery funded community project run by local artist Suzie Gutteridge with Salisbury Cathedral’s Outreach team, was inspired by the puttees given to the artist by her late father. A textile specialist who likes to create her own materials and work with ‘found’ objects, Suzie came up with the idea of mounting red felt poppies on 100 puttees sourced from a surplus store, and hanging them in the Cathedral’s Morning Chapel as a moving tribute to those who lost their lives on the field of battle. 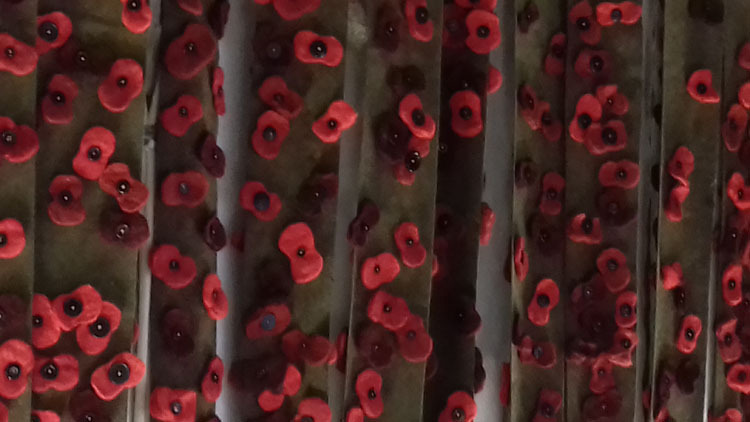 A “field of puttees” decorated with fallen poppies which visitors can interact with by walking through and around the installation. 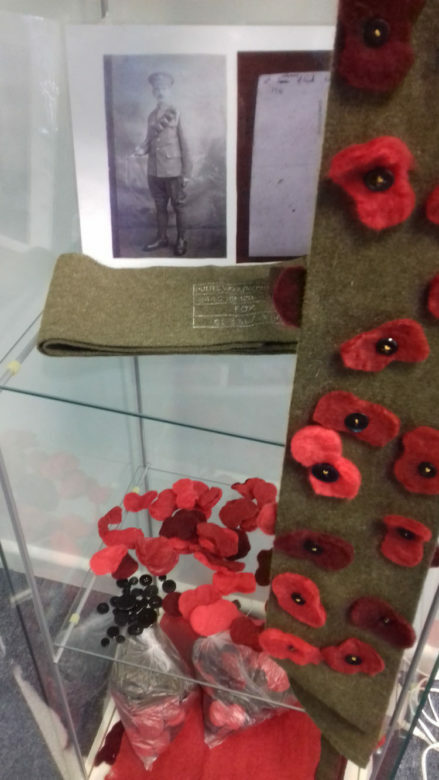 To create the display Suzie has been running community workshops, working with young and old to make the red felt for the flowers, and cutting out the poppies themselves. She then recruited helpers to sew the handmade poppies onto the puttees – approx 5000 of them!! This unique project also has lots of local history bound into it – hence the title. The puttees Suzie is using were made by Fox Brothers and Co Ltd, a Somerset based company that supplied puttees to the British Army who are still in business today. Back in the 1914-18 war the company produced 8,000 miles of khaki cloth for clothing and 70,000 pairs of puttees per week for soldiers in the field. Binding the Past to the Present Through Remembrance will be on display in the Morning Chapel of Salisbury Cathedral from 25 October until 25 November.